Parents' toolkit for children, ages 3 to 9. The GOOD PUPPY® Children Behavioral System is founded on four levels, each with a unique color, name, image and remark, stating good or bad choices and implying consequences. 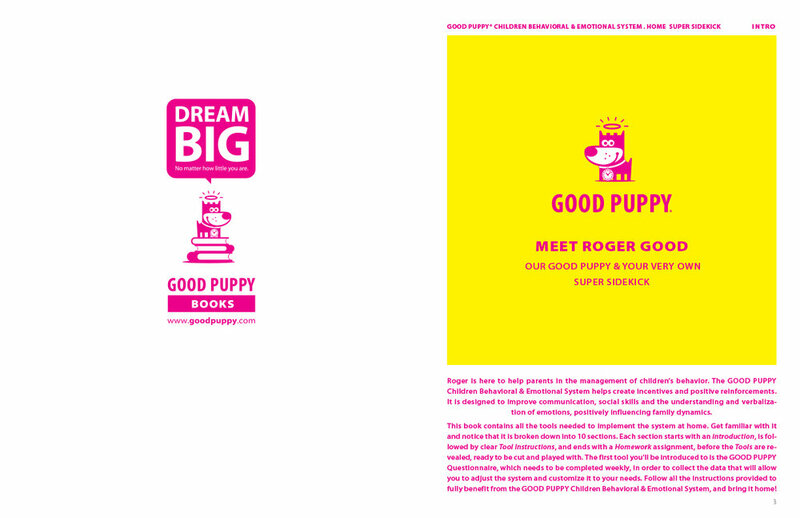 Get to know the GOOD PUPPY® Children Behavioral System to integrate the tools that best fit your child and lifestyle. You may choose to cut the pages of this book or keep it as a master you can make copies from for personal use. Kickstart your child in the right direction, welcome each morning by raising the GOOD PUPPY® Flag and reciting the GOOD PUPPY® Salute. Follow the GOOD PUPPY® Children Behavioral System instructions. Laminate your GOOD PUPPY® Flag for longer durability, cut and play! Consequences can be opportunities for rewards. They teach us responsibility for our actions and how to make choices in order to get what we would like most. GOOD PUPPY® Consequences are the backbone of the system. It is the consistent application of rewards and lost privileges, that provides a solid structure children can comprehend and the boundaries they seek. Follow the GOOD PUPPY® Children Behavioral System instructions. Cut your GOOD PUPPY® Consequences and play! The GOOD PUPPY® Children Behavioral System starts and revolves around this simple tool; four images, each representing a level of the system and tied to predetermined consequences. If used correctly and consistently, the child should learn to curb his/her own behavior in order to maintain all privileges. Follow the GOOD PUPPY® Children Behavioral System instructions and fill out the consequences on the back. Laminate your GOOD PUPPY® FRIDGE PUPPIES for longer durability, glue a magnet to the back or use a magnetic clip, cut and play! A reinforcement or alternative to the GOOD PUPPY® Fridge Puppies, GOOD PUPPY® Door Hangers give children a constant reaffirmation of good behavior or the time to think about wrong choices. Follow the GOOD PUPPY® Children Behavioral System instructions and fill out the consequences on the back. Laminate your GOOD PUPPY® Door Hangers for longer durability, cut and play! A reinforcement or alternative to the GOOD PUPPY® Fridge Puppies, GOOD PUPPY® Cards are the perfect tool on the go. Whether going out, traveling, or simply running to the store with the kids, GOOD PUPPY® Cards travel with you. Give a set to grandma or the babysitter and leave Roger in charge! Follow the GOOD PUPPY® Children Behavioral System instructions and fill out the consequences on the back. Laminate your GOOD PUPPY® 2Go Cards for longer durability, cut and play! A WIN-WIN FOR THE TEAM! Don’t get mad, just pull out your GOOD PUPPY® Yellow Card! Designed for outings, parties or any group activity. The GOOD PUPPY® Referee Cards are double sided and can be seen all around you, just like the referee you didn’t know you were. Follow the GOOD PUPPY® Children Behavioral System instructions. Laminate your GOOD PUPPY® Referee Cards for longer durability, cut and play! Whistle not included, but highly recommended. The perfect activity before bedtime! Review the day with your child with the GOOD PUPPY® Weekly Journal, it will prompt him to behave and go to bed without a fuss. The daily notes will build into a journal you can look back onto to review behavior changes, as a piece of nostalgia, or to explain why you did what you did twenty years from now! Follow the GOOD PUPPY® Children Behavioral System instructions, cut your GOOD PUPPY® Weekly Journal and play! You may choose to perforate them and store them in a binder, by date, for reference and safekeeping. THE BEHAVIOR POLICE, ALWAYS ON THE GO! A reinforcement to the GOOD PUPPY® Fridge Puppies, the GOOD PUPPY® Tickets keep the system active at all times. Tickets can be good or bad, given for infractions or given as rewards. Follow the GOOD PUPPY® Children Behavioral System instructions and fill out the consequence, or value of the ticket, on the back. Laminate your GOOD PUPPY® Tickets for longer durability and multiple use, cut and play! Awarded for good behavior, for homework or chores done, GOOD PUPPY® Gift Certificates can be made out to all sort of rewards, including gifts, events, outings, treats, etc. GOOD PUPPY® Gift Certificates help children manage their own behavior by reinforcing accountability. 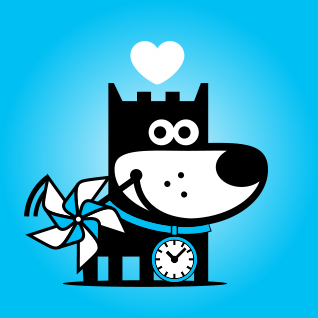 Cut your GOOD PUPPY® Gift Certificates and play! A clean and safe way to reward or limit a child’s privileges, GOOD PUPPY® Play Cash can be awarded for good behavior, for homework or chores done, but they can also be lost for bad behavior or charged for chores not done. Start by assigning your child a weekly allowance. Divide that number by 7 and match it with GOOD PUPPY® Play Cash. At the end of each day, give that sum in Play Cash to your child according to his behavior. At the end of the week, you may switch his Play Cash for actual money, a reward, or a GOOD PUPPY® Gift Certificate. Cut your GOOD PUPPY® Play Cash and play! An illustrious award for good behavior, an incentive for a weekly or monthly review of GOOD PUPPY® Journal charts, or even if needed, a way to point out astonishingly naughty behavior. GOOD PUPPY® Certificates of Achievement mark and commemorate all those special moments. Cut your GOOD PUPPY® Certificates of Achievement and play! Post the GOOD PUPPY® Emotions Chart somewhere visible to the child. This empathetic aid helps children visualize, narrow down and, ultimately, identify their emotions. It may also be used as a communication tool to help curb behavior or as a companion to the GOOD PUPPY® EmotiMatch Game. Laminate your GOOD PUPPY® Emotions Chart for longer durability, cut and play! Help your child visualize and identify emotions. The GOOD PUPPY® EmotiMatch Game is a fun memory exercise that aids children in the identification of feelings for better communication and self-awareness. Cut both sets of cards, mix them and place them all upside down in neatly organized rows and columns. A player at a time uncovers 2 cards to try to find a matching pair. When a player makes a match, he takes those 2 cards and gets another turn. The player with more matches, when all the cards are uncovered, wins. Laminate your GOOD PUPPY® EmotiMatch Cards for longer durability, cut and play! JUST SHAKE & LET YOUR SUPER SIDEKICK ROLL WITH THE CALL! Roger is ready to help your child identify and verbalize his feelings with a little visual empathy. Just shake your GOOD PUPPY® Emotions Dice, throw and answer the question on that color. The next player goes on to do the same. The end of the game is getting to know your feelings and each other’s. If you choose to laminate your GOOD PUPPY® Emotions Dice for longer durability, use a thin laminate that is easy to fold. Then cut, fold, glue, and play! A didactic game to familiarize children with feelings, the GOOD PUPPY® Emotions Domino is recommended as a support tool to the GOOD PUPPY® Emotions Chart, Dice & Emotimatch game. Laminate your GOOD PUPPY® Emotions Domino for longer durability, cut and play!